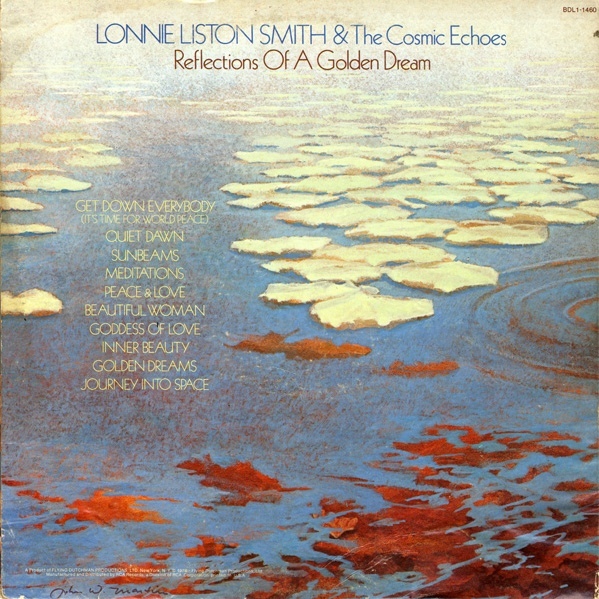 LONNIE LISTON SMITH AND THE COSMIC ECHOES-REFLECTIONS OF A GOLDEN DREAM. Of all the artists Bob Thiele signed to Flying Dutchman Productions, Lonnie Liston Smith and The Cosmic Echoes proved to be one the most successful. However, success didn’t come overnight for Lonnie Liston Smith and The Cosmic Echoes. Neither Lonnie Liston Smith and The Cosmic Echoes’ 1973 debut album Astral Travelling, nor 1974s Cosmic Funk charted. However, when Lonnie Liston Smith and The Cosmic Echoes released their third album Expansions, in 1975, it reached number eighty-five in the US Billboard 200, and number twenty-seven in the US R&B charts and number two in the US Jazz charts. Not only did this please Lonnie Liston Smith, but Bob Thiele’s paymasters at RCA. By the time Expansions was released, Bob Thiele had realised that he was fighting a losing battle. He needed a major label to take over Flying Dutchman Productions. RCA stepped in in 1974, taking charge of funding and distribution. This allowed Bob Thiele to do what he did best, A&R and production. The only downside was, that RCA weren’t a benevolent benefactor. RCA wanted Flying Dutchman Productions to release albums that were commercially successful. Bob Thiele must have agreed to this with a heavy heart. Some of the albums he had previously released were innovative and artistic merit, but were never going to sell in vast quantities. Now he would’ve have to think twice about releasing that type of album. It was a case of playing things safe, and thinking about what would sell. Luckily, by late 1975, one of Flying Dutchman Productions’ biggest seller was Lonnie Liston Smith and The Cosmic Echoes. In the summer of 1975, Lonnie Liston Smith and The Cosmic Echoes had released Visions Of A New World. It reached number seventy-four in the US Billboard 200, fourteen in the US R&B charts and number four in the US Jazz charts. Visions Of A New World was Lonnie Liston and The Cosmic Echoes’ most successful album. Lonnie Liston Smith and The Cosmic Echoes were on a roll, and were one of Flying Dutchman Productions’ biggest assets. That’s not surprising, as Lonnie Liston Smith was almost destined to embark upon a musical career. It was almost written in the stars that Lonnie Liston Smith would become a musician. Lonnie Liston Smith was born in 1940, into a musical family. His father was a member of Richmond Gospel music group the Harmonising Four. Growing up, members of gospel groups The Soul Stirrers and Swan Silvertones were regular visitors to the Smith household. With all this music surrounding him, Lonnie learned piano, tuba and trumpet in High School and college. After college, he headed to Morgan State University. Inspired by John Coltrane, Charlie Parker and Miles Davis, Lonnie Liston Smith embarked upon a degree in musical education. Throughout his time at University, Lonnie Liston Smith continued playing the pianist in local clubs and singing backing vocals. He played with alto saxophonist Gary Bartz and trombonist Graham Moncur. This was all part of Lonnie’s musical eduction. Having completed his BSc in musical education at Morgan State University, Lonnie Liston Smith walked straight into a job. Having left Morgan State University, Lonnie Liston Smith got a job with the Royal Theatre’s house band. For a young musician, this was would help turn them into a musical all-rounder. After all, they had to be able to accompany a wide range of artists. For Lonnie Liston Smith, this was the next stage in his musical education. The next part of his musical education took place in New York. Now living in New York, Lonnie Liston Smith was lucky enough to get a gig playing piano in Betty Carter’s band. This helped Lonnie Liston Smith get his name known in the Big Apple. Then in early 1965, Lonnie Liston Smith caught a break. He joined Roland Kirk’s band. Lonnie Liston Smith made his recording debut on March 14th 1965, when Roland Kirk recorded Here Comes The Whistleman. It was recorded live in New York, with Lonnie Liston Smith only playing on the title-track, Making Love After Hours, Yesterdays and Step Right Up. Having made his recording debut, Lonnie Liston Smith featured on Roland Kirk and Al Hibbler’s 1965 live album, A Meeting Of The Times. However, that was Lonnie Liston Smith’s swan-song with Roland Smith’s band. After this, Lonnie Liston Smith joined one of jazz’s top bands, The Jazz Messengers. Over the last few years, The Jazz Messengers had established a reputation for young musicians looking to make a name for themselves. Lonnie Liston Smith joined in 1965. He shared the role with Mick Nock and Keith Jarrett. However, with The Jazz Messengers ever evolving lineup, Lonnie Liston Smith only played three in concerts. These three concerts just so happened to be at the legendary Village Vanguard. Despite the prestigious venue, this must have been a disappointing time for Lonnie Liston Smith. Luckily, he was rehired by Roland Kirk. Now back with Roland Kirk’s band, Lonnie Liston Smith was just in time to play on his 1968 album Now Please Don’t You Cry, Beautiful Edith. This established Lonnie’s reputation as the go-to-guy for a pianist. It was the start of period where Lonnie worked with some of the most innovative and inventive jazz players. Musical boundaries were about to be pushed to their limits as Lonnie joined Pharaoh Saunders’ legendary free jazz band. Pharaoh Saunders had worked closely with John Coltrane right up to his death in 1967. The following year, Pharaoh formed a new band. Their music is best described as free jazz. Musical boundaries were pushed to their limits and beyond. Recognising a fellow believer in free jazz, Pharaoh Sanders asked Lonnie to join his band. Lonnie Liston Smith went on to play on three of Pharaoh Sander’s best albums. The first of this trio was 1969s Karma. It was followed in 1970 with Jewels of Thought and 1971s Thembi. The other Pharaoh Saunders album Lonnie played on was 1970s Summun Bookman Umyun. which was released on Impulse. Just like the three albums Pharaoh Sanders recorded for Flying Dutchman, it was a groundbreaking album. During this period, Pharaoh Sanders and his band were constantly pushing boundaries and rewriting the musical rulebook. Their music was truly groundbreaking. Even Lonnie Liston Smith was challenged. On Thembi, Pharaoh Sanders asked Lonnie Liston Smith to play the Fender Rhodes. This was the first time that he came across an electric piano. However, Lonnie Liston Smith rose to challenge and wrote Thembi’s opening track Astral Travelling. Later, Astral Travelling would become synonymous with Lonnie Liston Smith and The Echoes. Before that, Lonnie would play with some of jazz’s mavericks. One of these mavericks was Gato Barbieri. He’d just signed to Bob Thiele’s nascent label Flying Dutchman Productions. It was establishing a reputation for providing musicians with an environment where innovative and creative musicians could thrive. Bob Thiele believed musical mavericks didn’t thrive within such an orthodox environment. Their creativity is restricted, meaning they’re unable to experiment and innovate like they’d like. So, Bob Thiele signed Gato Barbieri to Flying Dutchman Productions. Lonnie Liston Smith played on his 1969 debut album The Third World. Bob Thiele’s next signing was Leon Thomas and played on his debut album Spirits Known and Unknown. Soon, Lonnie Liston Smith was a regular at Flying Dutchman Productions’ sessions. When the time came for Gato Barbieri to record his 1971 sophomore album Fenix, Lonnie Liston Smith was called upon. He played on Fenix and joined Gato Barbieri’s band. Lonnie Liston Smith played on Gato Barbieri’s 1972 album El Pampero. He also toured throughout Europe with Gato Barbieri. Then came the opportunity of a lifetime. After El Pampero, Lonnie Liston Smith got the chance to work with another jazz legend. Lonnie Liston Smith was a member of Gato Barbieri’s band when Miles Davis got in touch. He wanted Lonnie Liston Smith to join his band. At this time, Miles Davis’ music was changing direction. The direction it was heading in was funk. Electronic instruments were the flavour of the month for Miles Davis, who was exploring their possibilities. However, Miles Davis was doing this outside the studio environment. That’s why there are very few recordings of Lonnie Liston Smith playing alongside Miles Davis at that time. That came later, when Lonnie Liston Smith would later work with Miles Davis. Meanwhile, Lonnie Liston Smith decided to move on, and embark upon a solo career. There was a sense of inevitability that Lonnie Liston Smith would sign Flying Dutchman Productions. He had played on numerous albums the label released. Lonnie Liston Smith’s musical style suited Flying Dutchman Productions. It all made sense. So in 1973, Lonnie Liston Smith signed to Flying Dutchman Productions, and began work on his debut album Astral Travelling. When recording of Astral Travelling began, Lonnie Liston Smith had put together some of the most talented and innovative musicians. The Cosmic Echoes’ rhythm section included bassist Cecil McBee, drummer David Lee and guitarist Joe Beck. Sonrily Morgan and James Mtume played percussion and conga, Gee Vashi tamboura and Badal Roy tabla. George Barron played tenor and soprano saxophone. Lonnie Liston Smith played piano and electric piano on Astral Travelling which was produced by Bob Thiele. Astral Travelling was released in 1973. On its release in 1973, Astral Travelling was released to critical acclaim. This was no surprise. Lonnie Liston Smith had worked with some of the biggest names of jazz. It was akin to a musical apprenticeship. Astral Travelling saw Lonnie Liston Smith move from sideman to bandleader. Accompanied by some of the best and most innovative musicians, he had created an ambitious and groundbreaking album. Although Astral Travelling failed to chart, it sold reasonably well upon its release. This bode well for the future. The followup to Astral Travelling, Cosmic Funk was released in 1974. Lonnie Liston Smith and The Cosmic Echoes’ genre-hopping sophomore album was released to widespread critical acclaim, and sold reasonably well. However, Cosmic Funk wasn’t going to make Lonnie Liston Smith rich. At least word was spreading about this musical visionary. Soon, Lonnie Liston Smith and The Cosmic Echoes would be enjoying both commercial success and critical acclaim. For Lonnie Liston Smith and The Cosmic Echoes’ fourth album, Visions Of A New World, Lonnie penned seven tracks, including Lonnie’s hopeful anthem, A Chance For Peace. The other track, Devika (Goddess) was written by Dave Hubbard and Sarina Grant. These eight tracks were recorded at Electric Ladyland Studios, New York, and Visions Of A New World was released in the summer of 1975,. Just like previous albums, critics hailed Visions Of A New World as a groundbreaking album. Lonnie Liston Smith was seen as a musical pioneer, capable of creating innovative and influential music. That music was way ahead of the musical curve. Record buyers concurred. When Visions Of A New World was released in the summer of 1975, it reached number seventy-four in the US Billboard 200, fourteen in the US R&B charts and number four in the US Jazz charts. Visions Of A New World was Lonnie Liston and The Cosmic Echoes’ most successful album. However, could Lonnie Liston Smith make it three successful albums in a row, when he released Reflections Of A Golden Dream, which was recently released by BGP, an imprint of Ace Records. Critics when they received their advance copies of Reflections Of A Golden Dream, found Lonnie Liston Smith and The Cosmic Echoes combining dance-floor friendly music with social comment on Get Down Everybody (It’s Time For World Peace) and Peace and Love. Meditations featured a much more pensive, spiritual sound; while Journey Into Space saw Lonnie Liston Smith became a musical voyager. Just like previous albums, Reflections Of A Golden Dream received plaudits and critical acclaim. That was all very well. However, would Reflections Of A Golden Dream ensure that Lonnie Liston Smith and The Cosmic Echoes run of commercial success continued? When Reflections Of A Golden Dream was released in 1976, the album sold well, but didn’t match the commercial success of Visions Of A New World. It remained the most successful album of Lonnie Liston Smith and The Cosmic Echoes’ time at Flying Dutchman Productions. 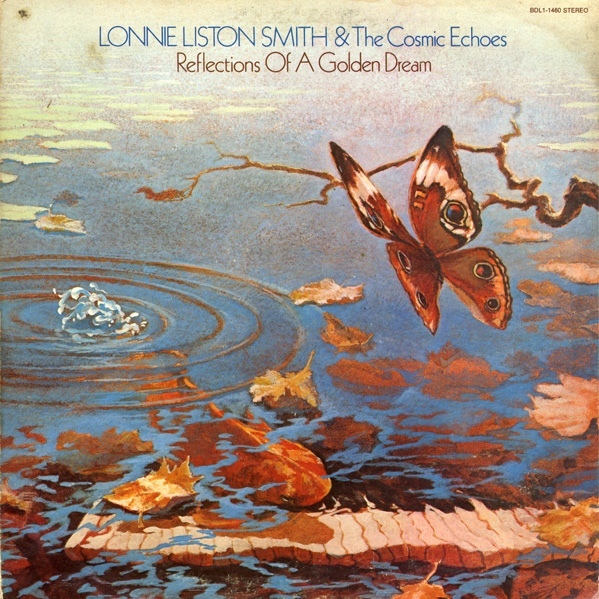 Reflections Of A Golden Dream closed the door on that chapter of Lonnie Liston Smith and The Cosmic Echoes career. Was it a fitting swan-song? Reflections Of A Golden Dream opens with Get Down Everybody (It’s Time For World Peace). A pulsating beat joins myriad of percussion and effects. Harmonies the soar soulfully above the arrangement, as Lonnie Liston Smith encourages: “Get Down Everybody (It’s Time For World Peace)”. Toughening up the dance-floor friendly are keyboards and stabs of blazing horns. Soon, though, the arrangement is focusing solely on the dance-floor. This isn’t surprising, as 1976 was the peak of the disco boom. Lonnie’s vocal veers towards a vamp, as his soulful triumvirate of backing singers play an important part in the song’s success. So the horns and the rhythm section, who propel the arrangement along, as seamlessly, elements of disco, funk, jazz and soul unite. Quiet Dawn has a much more laid-back, dreamy sound. Swathes and swells of strings float above the keyboards, while percussion is at the heart of the arrangement. The bass augments the percussion, as Lonnie Liston Smith’s piano plays slowly and thoughtfully. As the arrangement flows elegiacally along, a breathy flute flutters. One can’t help but wallow in its beauty of Quiet Dawn, which is omnipresent. Layer upon layer of percussion is at the heart of the arrangement to Sunbeams. Meanwhile, the rhythm section of bassist Al Anderson and drummer Wilby Fletcher are playing leading roles. Al Anderson’s bass line has a vibrancy and energy. Wilby Fletcher picks up on this. So does Dave Hubbard’s flowing soprano saxophone. It augments Lonnie Liston Smith’s keyboards. They’re driving the arrangement along, as he plays with freedom and flamboyance. Later, David Smith, Lonnie Liston Smith’s brother adds flute. Lonnie Liston Smith’s piano looks like stealing the show. However, is performance can’t exist in isolation, and Sunbeams’ sound and success is down to Lonnie Liston Smith and The Cosmic Echoes. Unsurprisingly, Meditations has ruminative quality. Washes of Lonnie Liston Smith’s Fender Rhodes are like waves breaking on a deserted beach. Accompanying Lonnie Liston Smith is a myriad of percussion. That’s all that’s needed as a quite beautiful, melodic track washes over you, reminding you of warm summer days on a sun kissed beach. An Iberian acoustic guitar is panned right on Peace and Love. It’s all that the listener hears. Soon, the trio of backing vocalists return, demanding: “we need peace, we need love.” A clavinet is panned left, and adds a tough funk sound, and Donald Smith takes charge of the lead vocal. By then, jazz and funk are combining with the soulful backing vocals. There’s even a nod towards fusion, as Peace and Love looks like taking on an anthemic sound. It’s reminiscent of Lonnie Liston Smith’s previous anthem, Give Peace A Chance and features a similar mixture of hope and social comment. Beautiful Woman finds Lonnie Liston Smith and The Cosmic Echoes playing as one. The rhythm section provide a funky backdrop. Bassist Al Anderson plays a leading role, anchoring the arrangement, and providing its heartbeat. Lonnie Liston Smith plays a variety of keyboards, including a clavinet. It adds tough, funky sound. Other keyboards add layers. So do the percussion. Atop the arrangement, Donald Smith adds a tender, heartfelt vocal. Later, it grows in power, soaring above the arrangement. By then, Lonnie Liston Smith and The Cosmic Echoes have found their A-Game, and are their funky best, on what’s one of Reflections Of A Golden Dream’s highlights. The tempo drops on Goddess Of Love. Still, though, the song has a funky sound, which flows and meanders along. Not for the first time, echo is deployed, meaning was of Fender Rhodes run into each other. Meanwhile, the rhythm section create a mid- tempo, funky beat and strings sweep creating an elegiac, wistful track. Inner Beauty is described as a “mood piece.” Lonnie Liston Smith adds flamboyant flourishes of piano and David Hubbard delivers a masterclass on soprano saxophone. A myriad of percussion and congas provide the backdrop for David Smith’s scatted vocal on what’s a thoughtful, ruminative sounding track whose Inner Beauty is there for everyone to hear. Golden Dreams almost shuffles into being, a piano playing before a Fender Rhodes shimmers. Then the rhythm section join percussion and a flute. Together, they provide the backdrop for Lonnie Liston Smith’s tender, hopeful vocal. Above his vocal, the arrangement shuffles and meanders along, showcasing not just Lonnie Liston Smith’s skills a pianist, but as a vocalist. Journey Into Space, which closes Reflections Of A Golden Dream, is another short mood piece. It’s just two-and-a-half minutes long. The introduction is almost otherworldly, and has an experimental, avant garde sound. A flute replicates the sound of an exotic bird or animal, while the rest of The Cosmic Beings add percussion or produce a variety of left-field, experimental sounds. The result, is an ambitious piece of music, which is reminiscent of the more experimental music Flying Dutchman Productions released in the early days. This track could easily have been recorded in the early seventies, when Leon Thomas was producing some of his most groundbreaking work. By 1976, when Lonnie Liston Smith and The Cosmic Echoes released Reflections Of A Golden Dream, Flying Dutchman Productions was a very different company. It was owned by RCA, who didn’t take kindly to experimental albums which were only purchased by discerning musical connoisseurs. Instead, RCA wanted albums that sold in vast quantities. Luckily, Bob Thiele had signed Lonnie Liston Smith and The Cosmic Echoes in 1973. Lonnie Liston Smith and The Cosmic Echoes first two albums weren’t a commercial success. Neither 1973s Astral Travelling, nor 1974s Cosmic Funk charted. That’s despite featuring some of the best music Lonnie Liston Smith and The Cosmic Echoes released during his time at Flying Dutchman Productions. Things improved with Expansions in 1975. 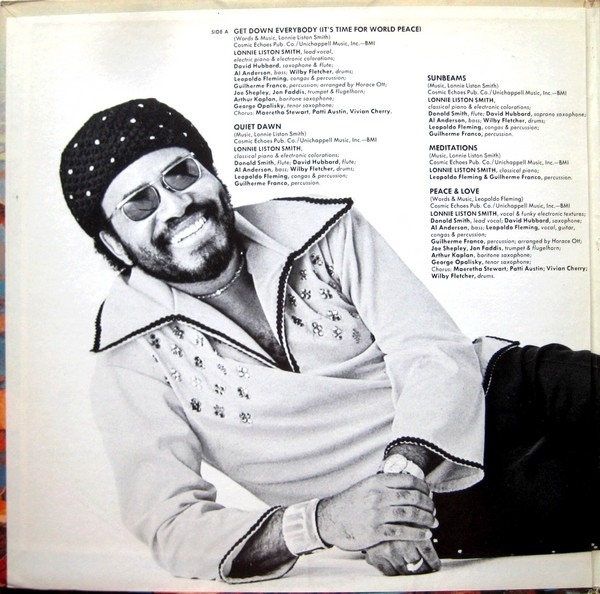 Expansions, Lonnie Liston Smith and The Cosmic Echoes’ third album became one of Flying Dutchman Productions’ most successful albums. However, this record didn’t last long. When Lonnie Liston Smith and The Cosmic Echoes released Visions Of A New World in the summer of 1975, it surpassed the commercial success of Expansions. Lonnie Liston Smith and The Cosmic Echoes, who were Flying Dutchman Productions’ most successful signing, were on an enviable hot streak. This hot streak continued with Reflections Of A Golden Dream, when it was released in 1975, and has recently been reissued by BGP, an imprint of Ace Records. Although it neither reached the heady heights of Expansions nor Visions Of A New World, Reflections Of A Golden Dream was one of Flying Dutchman Productions’ most successful albums of 1976. 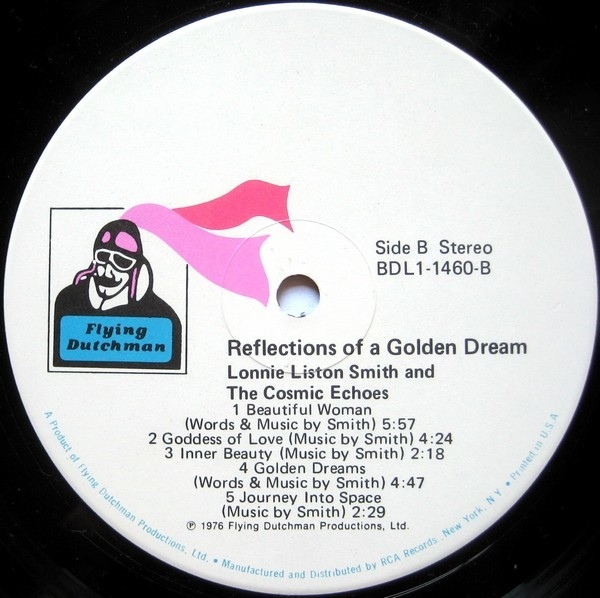 However, Reflections Of A Golden Dream was also Lonnie Liston Smith and The Cosmic Echoes’ final album for Flying Dutchman Productions. Between 1973 and 1976, Lonnie Liston Smith and The Cosmic Echoes released a quintet of albums for Flying Dutchman Productions. Three were commercially successful. Ironically, Astral Travelling, Lonnie Liston Smith and The Cosmic Echoes’ debut album, which failed commercially, is now regarded as a minor classic. However, all the albums Lonnie Liston Smith and The Cosmic Echoes released at Flying Dutchman Productions are held in the highest regard. This includes Lonnie Liston Smith and The Cosmic Echoes’ Flying Dutchman Productions’ 1976 swan-song, Reflections Of A Golden Dream. It’s a mixture of disco, funk, jazz and soul on Reflections Of A Golden Dream, where Lonnie Liston Smith and The Cosmic Echoes flit between musical genres and moods. Joyous gives way to pensive, before beatific becomes beautiful, and elegiacal becomes ethereal. Later, anthemic becomes otherworldly and ambitious, as Lonnie Liston Smith and The Cosmic Echoes take their bow on the genre-melting Reflections Of A Golden Dream, which was their Flying Dutchman Productions swan-song. ← SOUTH TEXAS RHYTHM ’N’ SOUL REVUEW 2-FROM THE VAULTS OF CRAZY CAJUN RECORDS.